Consensus Among World's Leading Experts: Marijuana Is a Botanical Medicine! The more than 70 years of ignoring the fact that cannabis is a safe, effective botanical medicine is officially over. 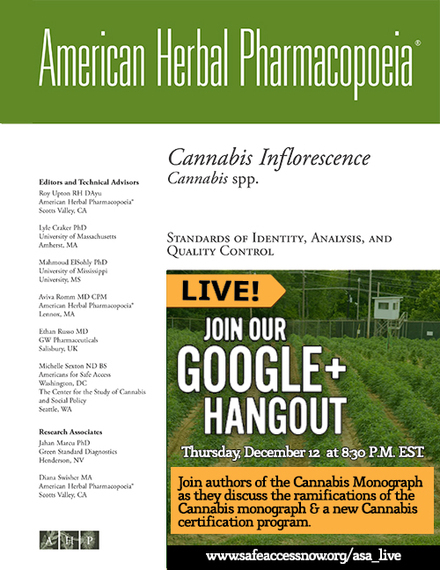 The American Herbal Pharmacopeia (AHP) has just sent to press a monograph that returns cannabis to its place as an accepted herbal medicine alongside other Complementary and Alternative Medicines (CAM), now with the modern standards of analysis that patients, health care professionals, and regulators need to act with confidence. Produced by the world's leading experts on cannabis, this comprehensive document represents the consensus opinion of the most knowledgeable representatives from scientific research, pharmaceutical development, naturopathic medicine and even those contracting with the US federal government -- including Dr. Mahmoud A. Elsohly, the scientist in charge of producing all the American research cannabis, and Dr. Raphael Mechoulam, the Israeli professor who first identified the constituent components of cannabis and the receptors in the human endocannabinoid system. The cannabis monograph is being released in two parts because it will be among the largest of the 30 herbal monographs so far produced by the AHP, and also because the States of Washington and Massachusetts need its quality assurance protocols to implement their medical cannabis laws. The first part, Standards of Identity, Quality, and Testing, offers the definitive account of the plant's botany and constituent components, providing scientifically valid ways for patients, providers, and regulators to be sure of the identity, purity, potency, and quality of cannabis products. That will not just make getting the right medicine easier for patients; it allows health care professionals to recommend it with more confidence and creates the foundation for expanded research opportunities. The second part, the Therapeutic Compendium, catalogs all that is now known about how cannabis can treat a remarkable variety of conditions -- from chronic pain and multiple sclerosis to autoimmune disorders and cancer. It covers indications, contraindications, side effects, dosing, preparations, safety, use in pregnancy, and interactions with conventional medications. It also chronicles the 5,000-year history of its use as a medicine -- from ancient Chinese medicine and the ayurvedic practices of India to the cannabis medicines widely produced by Eli Lilly and other American pharmaceutical companies until the late 1930's, when the federal government made them virtually impossible to produce or prescribe. Until it was removed from the 12th edition of the U.S. Pharmacopoeia in 1942, cannabis had for 91 years held an important place in American medical treatment, ever since 1851 when the first cannabis monograph was introduced in the Pharmacopoeia's 3rd edition. Seeing it return to its rightful place as a botanical medicine, one that hundreds of thousands of patients and doctors can attest it deserves, is momentous, and not just for the medical marijuana movement. Certainly, restoring its classification will mean much for all of us who depend on medical cannabis for our well-being -- expanded research and medical acceptance, improved quality assurance and better consistency for our medicine. But it will mean even more to the hundreds of thousands of patients who have suffered without it because of concern that cannabis lacks the analytic standards that would qualify it as a botanical medicine. This monograph answers that concern, providing a foundation for more health care professionals to integrate cannabis therapeutics into their practices on the basis of a full scientific understanding of the plant, its constituent components, and its biologic effects. That's why we at Americans for Safe Access, the nation's leading medical cannabis advocacy organization, were more than happy to help underwrite the preparation of this monograph, and I was honored to be one of the reviewers. Thanks to the work contributed by the remarkable collection of experts AHP pulled together, including Dr. Michelle Sexton, a naturopathic expert who serves on our board, we now have the ability to quantify the key cannabinoids that affect therapeutic effects and identify potentially harmful pesticides, metals, and microbes. These validated standards for analysis and production will let us assure the quality of cannabis and related products in ways that provide a new level of confidence for patients, professionals and regulators. Tomorrow, Thursday, December 12, Americans for Safe Access is hosting a Google Hang-out with several of the authors of the monograph to discuss the significance of this landmark publication and answer questions about it. Join us tomorrow to hear from AHP Executive Director Roy Upton, RH, DAyu; Professor Lyle Craker, PhD, of University of Massachusetts Amherst; and Dr. Michelle Sexton, ND, and Dr. Jahan Marcu, PhD, of the Americans for Safe Access Multidisciplinary Scientific Advisory Board. No more should cannabis be considered a dangerous drug with no medical value. As an herbal medicine, cannabis can be better understood and its benefits more widely realized. Finally, patients and doctors have a set of standards that can replace the federal government's outdated and harmful approach to medical marijuana.